Before I start, just a reminder that Linnaeus' Legacy is happening in two days' time, so get your posts in to me quick! This week's Taxon of the Week is the Struthiolariidae, a family of marine gastropods (specifically caenogastropods, a large clade characterised by the possession of a feeding proboscis) commonly known as "ostrich foot shells". I have to confess complete ignorance as to why they are supposed to resemble an ostrich's foot. If you look at the photos above of Struthiolaria papulosa (from gastropods.com), I suppose you might be able to see a resemblance if you exercise a significant amount of imagination, but I doubt it would be the first thing I would think of. Ostrich foot shells are an entirely Southern Hemisphere family, found in cooler waters. Despite a fossil record extending back to the Cretaceous, the Struthiolariidae is currently not a very speciose family - gastropods.com lists only seven species. New Zealand is the current centre of diversity (four species), and also the source of the oldest known fossil struthiolariids of the genus Conchothyra. A single species is known from Australia, one from South Georgia, and one from South Georgia and Kerguelen. Struthiolariids can reach a respectable size - Struthiolaria papulosa can be nearly 9 cm long. The thickened lip that can be seen around the shell opening in the photo above is considerably stronger than the rest of the shell, and often remains intact long after the remainder has worn away - they are a common find on sandy New Zealand beaches. Struthiolariids show two major modes of movement. They may crawl about on the foot like most gastropods, or they may use a more dramatic mode of movement in which fluid is drawn from the foot and the small operculum (visible in the photo at the top) is directed downwards. The operculum ends in a sharp hook, and this is used to push against the sediment and lunge the animal forward in a clumsy leap (in the related Strombidae, the conches, the sole of the foot has become permanently reduced and this second method is their only way of moving). This opercular movement can also be used to right the animal when it becomes tipped upside-down. Crump (1968) recorded that opercular movement was used when the animal came in touch with a sea star to throw itself into a series of rapid somersaults to carry itself away from the potential predator (figure above from Crump, 1968). Morton (1951) also suggested a defensive function for the operculum - when a live specimen was held away from the substrate, the operculum would be extended out in an attempt to gain a purchase. Even if this was primarily the usual righting action, the sharp, hooked operculum being waved about could quite possibly deter a potential predator. Despite being quite capable of moving about, struthiolariids are actually sessile filter-feeders by habit. The above figure from Morton (1951) shows a specimen of Struthiolaria papulosa buried beneath the sand in feeding position. The animal digs itself into the sand using its foot, and the long proboscis is used to construct two mucus-lined tubes that house the inhalent and exhalent siphons. A continuous stream of water and particulate matter is taken in through the inhalent siphon, filtered through the mucus-producing endostyle and the gills, and the filtered water is expelled through the exhalent siphon while the particulate matter is trapped in a string of mucus and carried along a specialised food grove to the front of the animal, where it can be ingested through the proboscis. 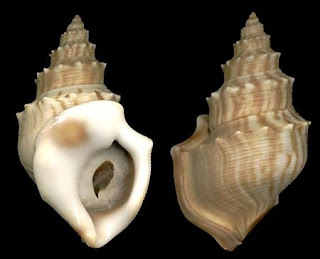 The gastropod family most closely related to the Struthiolariidae, the pelican's foot shells of the Aporrhaidae, share the characters of the paired siphons and infaunal living habit. However, the aporrhaids do not have the gills specialised into feeding structures as in the struthiolariids. Instead, the aporrhaids use the strong current produced the movement of water over the gills to draw particulate matter towards the front of the animal, where it is picked up by the proboscis in the normal caenogastropod fashion. In 1937, before the lifestyle of the Struthiolariidae had ever been investigated, Yonge suggested that the mode of feeding found in Aporrhaidae was a possible precursor to ciliary feeding as found in many mollusc groups. It therefore came as significant support to Yonge's speculations when the exact development in feeding mode he had suggested was discovered by Morton (1951) in the aporrhaids' closest relatives. Crump, R. G. 1968. The flight response in Struthiolaria papulosa gigas Sowerby. New Zealand Journal of Marine and Freshwater Research 2: 390-397. Morton, J. E. 1951. The ecology and digestive system of the Struthiolariidae (Gastropoda). Quarterly Journal of Microscopical Science s3-92: 1-25. The shell doesn't look like an ostrich foot, but the animal itself sure does, in Fig. 2 at least. It is interesting that one family evolved such drastic modifications of 2 common gastropod organs, gills to capture food and operculum for locomotion.